On Saturday the 8th of May, the Fermain Tavern, Guernsey saw the greatest night of live music and homemade munchies they have ever seen!! Ok a slight exaggeration but we’re pretty sure that it was up there with the best of them!! 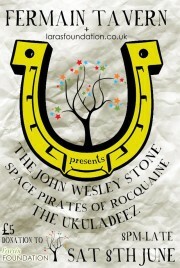 The bands – ‘The John Wesley Stone’, ‘Space Pirates of Rocquaine’ and ‘The Ukuladeez’ rocked the live music venue, with people literally shouting for encores! Even a local Guernsey Statesman joined the party and was seen for most of the night boogying at the front of the dance floor! Goodies such as cupcakes, muffins and INCREDIBLE sausage rolls sold like, well, hotcakes and the fabulous Lara’s Foundation tote bags were a massive hit. The venue was packed with friends Lara made during her summer in Guernsey, music lovers and supporters of a great cause all getting involved and donating generously to raise a whopping £880 and counting…. Special thanks go to Joey and Pete De Mouilipied for all their hard work in arranging the gig, to the owners of the venue and the band members for offering their venue and services for free, and to the army of helpers on the night. Your hard work really paid off and we are SUPER grateful. We have no doubt that Lara would have VERY much approved of the evening! Everyone was very keen to make this an annual event…so watch this space!! !